This image illustrates how the special 3D mask developed by scientists at MESA+ patterns two sides of a silicon wafer simultaneously. Scientists at the University of Twente's MESA+ research institute in the Netherlands have developed a new manufacturing method for creating three-dimensional (3D) nanostructures, which could be used for the large-scale production of photonic crystals that can capture light. This discovery could also make it possible to produce chips with additional functions for mobile devices, computers and other applications. The researchers’ findings are published in Nanotechnology. 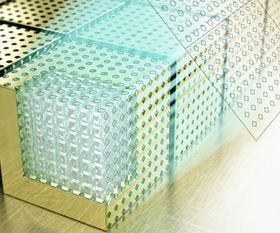 The conventional method for manufacturing 3D nanostructures consists of stacking layers on a silicon chip. The first step involves writing (or defining) a pattern in a photoresist, using a mask and UV light; this photoresist is then used to replicate the pattern in each layer by etching or depositing material. Dozens of these layers are stacked to produce the chips themselves, which is a laborious process with limitations. There are restrictions on the number of layers that can be stacked, since layers that are distant in the stack can become randomly displaced with respect to one another, interfering with the chip’s functionality. The new method makes it possible to define a 3D nanostructure on a chip in a single process. The team of MESA+ scientists, led by Willem Vos of the Complex Photonic Systems group (COPS), has developed a special 3D mask that can define a pattern on two sides of a silicon wafer simultaneously. This ensures that both sides of the chip are neatly aligned, thereby guaranteeing the vertical alignment of the final three-dimensional nanostructure. Vos and his team colleagues discovered this new method while working to develop new types of photonic crystals. The method opens the way for the mass production of chips in which various functionalities are positioned close together. The scientists are now investigating ways of implementing this new technology in practice. There are possible applications in the medical world; for example, by combining an optical sensor for proteins with a data processing chip and a magnetic memory. “Our method makes it possible to combine an endless variety of features on a chip, such as electronics, optics, magnets and microfluidics,” explains Vos. This story is adapted from material from the University of Twente, with editorial changes made by Materials Today. The views expressed in this article do not necessarily represent those of Elsevier. Link to original source.